One might think that this episode would throw off the steam that the Diaz storyline is starting to gain. Truth be told, I may have been with you there. (Especially seeing how we’re coming out of a lengthy hiatus.) However, I found this to be a pretty neat little story that leaves the door open for things in the future, while serving as a potential goodbye to Speedy and Arsenal. As you know, I relate a lot of things to hockey—that’s just how it is for me. Tonight’s episode felt a little bit like a trade. It’s not uncommon in sports for a team to move a player or players in order to bring in other players. In hockey, there is a pretty strict salary cap—which limits the amount of money that a team can spend on player salaries. That’s why a lot of times you’ll see teams shed players to free up some cap space to hopefully bring in another player or prospects they’ve been targeting. I think tonight did something very similar, except it happened in the Arrowverse. 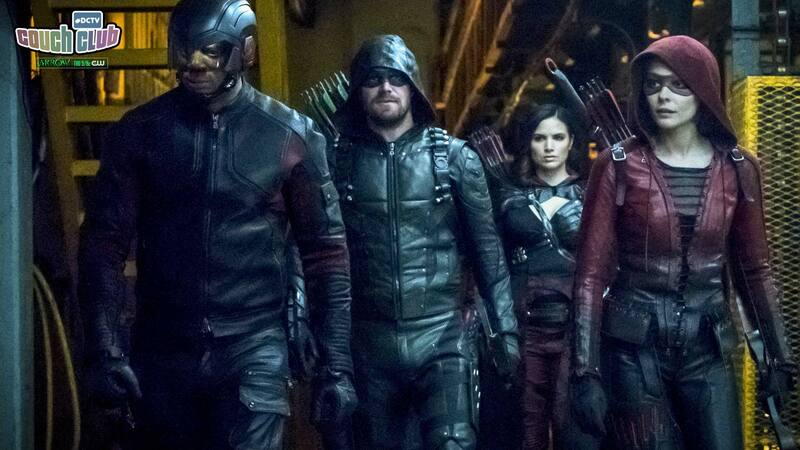 There are a lot of characters and storylines currently happening within Arrow right now, moving two out in Speedy and Arsenal (if they really are gone), potentially opens the door for Dragon and his story to get more focus—which should be exciting because he seems like he’ll be a pretty legit villain. But let’s jump into what we just watched! It was a lot like Scooby-Doo in the sense that we saw a handful of characters team up and try to unwrap a mystery. Only…there wasn’t some old guy who ran an amusement park that they end up unmasking at the end. HA! On a serious note, I really did like the whole Pandora’s Box element they brought tonight. The mystery of not knowing what they were looking for and why was awesome. That really held my interest and had me wanting to know what exactly they were seeking out. A good mystery story is always nice to watch because you feel like you’re right there with the characters, uncovering everything at the same time they are. I usually end up talking to my TV way more than usual, too. I think tonight also planted a couple seeds for some future plotlines. The first was John mentioning that he’d like to be Green Arrow again. If you’ve been picking up on the subtle queues the past few episodes, you undoubtedly know that he feels the mantle of Green Arrow was taken away from him too quickly. I think he understands why it happened, but now that his hand is healed up, John wants that responsibility back—it’s obvious. I feel like this is going to boil over and create either an awkward rift or a full blowout between the two friends. I guess only time will tell. Speaking of rifts…that’s where the second of what I believe will develop into major plotlines comes into play. If we’re sticking with the hockey theme from earlier, it’s obvious that Rene has been placed on LTIR (long term injured reserve), and I doubt we’ll see him again this season. That opens up the door for Curtis to play a bigger role. It would appear to me that the writers are taking this opportunity to start expanding on him more by sparking up a love story between him and the cop at Dinah’s precinct. There’s only one problem…that guy is crooked and both Dinah and Curtis know it. If Curtis lets his heart do the thinking, instead of his brain, this will no doubt create major problems and drive a huge wedge between the two heroes—most likely ending their team-up. By the way, I got a pretty good laugh at that standard aloof TV cop moment when he sees Curtis in an area—where clearly only police should be—but instead of pressing/questioning him, he instantly offers to give Curtis a tour of the building. Haha! Were you guys satisfied with Speedy’s exit? Are you happy or will you miss her character? Personally, I thought she was a good rock for Ollie and a number of the other characters. She was more grounded and could see the big picture a lot of times, which helped other characters when they were struggling with various issues. We’ll see what next week has to offer!